The notorious criminal Kain has escaped from the Galaxy Police (GP) Headquarters. He had been captured before through the joint efforts of the Jurai Royal Family and the GP. Around the same time, Tenchi`s house on Earth suddenly disappears... even Tenchi himself is fading fast! It seems that Kain has gone back to the past to alter things to his favor. 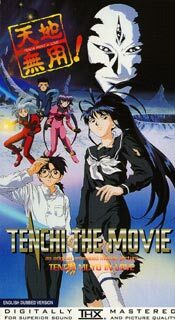 Tenchi and the gang must now go back in time, back to 1970, and save Tenchi`s parents from certain doom in the hands of Kain.